Recreate Hollywood Movie Scenes and your own start to finish productions with your Mobile Phone. 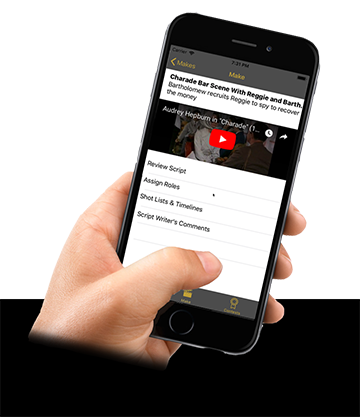 Introducing the Movie Skits Director App, an IOS app that works hand in hand with our website’s Script Editor and Shot List Setup tools to help make mobile filmmaking simple, fun and convenient. Or use our tools for your own private start to finish mobile film productions. We bring the pieces together and cut scripts into separate shots, or users will soon be able to publish their own scripts with shot lists for others to use. Directors simply focus on one shot at a time. Each 'Take' goes to the timeline so there’s no complicated editing, as all the shots get stitched together into one complete video at the end. Just follow along in the app, taping each shot one by one until all are complete. Press a button to merge all shots into one and Publish your video creation of a Hollywood scene or your own script. Find A Script to Make. You Can Choose From . . .
You can find scenes from Hollywood movies on Movie Skits that we’ve made ‘Skit Ready’. By 'Skit Ready', we mean the script is written in standard Hollywood format, characters are set up, and there is a shot list matching the original scene. 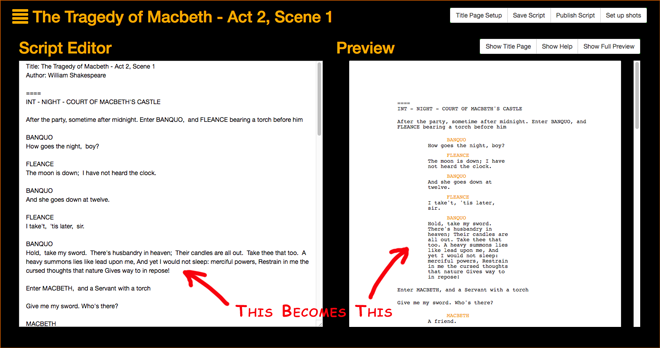 Just choose the 'Make' button for the script to begin creating your remake using our app. Right now we offer sample Hollywood oldie scripts that are in the public domain. We’re actively recruiting scenes from new releases of indy films, and we hope to license content from major Hollywood studios. By posting scenes from upcoming or newly released movies and letting fans recreate them, it’s a great way for a movie studios to promote their films. Aspiring screenwriters can write scripts for skits using the Script Editor on our website, or using our soon to be released Write Scripts add-on for our already released Movie Skits Script Studio mobile IOS app. Then they can set a shot list and soon will have the option to Publish it for others to use. and a youtube video embed of any video shared to social media is also uploaded back to Movie Skits associated with the script when that feature is available. Aspiring screenwriters write scripts for skits using our Scripts For Skits software on our web site, or using our soon to be released Write Scripts For Skits mobile app. Easily type in plain text using the Fountain markup language. Use our handy fountain syntax guide if you forget something. The script automatically gets formatted into a Hollywood screenplay format. Besides finding Skit Ready Hollywood scenes, and soon even user submitted scripts, Movie Skits users can right now write a script and set a shot list for use in the app for their own Private productions. In the Write section of our site, after you signup and login, easily type in plain text using the Fountain markup language. Use our handy fountain syntax guide if you forget something. 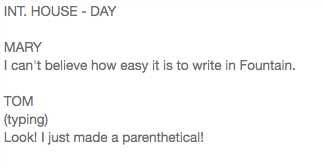 The script automatically gets formatted into a Hollywood screenplay format. Shows a screen grab of Write section of Movie Skits web site. When your script is written, proceed to add a Shot List. Authors make a shot list in the Set up Shots section of the Script Editor on the website. To set a shot, select the section of a script for that shot – it’s action and dialog – and then click Add Shot to input the shot details like Shot Type, Camera Angles, Camera Movement. When you Save your script and it's shot list, they become available in the Movie Skits Director app for your own personal use. Shows Set Up Shots screen of Movie Skits web site. Shots set up on web site end up in the Shot List in the app. Soon user submitted scripts with their shot lists may be published to Movie Skits, permitting the Movie Skits community to use it as the script for a video skit they create. The writer keeps the copyright to the script for a skit, but grants a license to Movie Skits video skit producers, allowing them to use Movie Skits Director App to make a video skit of their script to publish on social video channels for non-commercial purposes. In return for using your script, Movie Skits video directors commit to give you script author credit and to publish their video back to Movie Skits associated with your script. Once you've chosen a script to make, either a Hollywood scene, a user submitted script, or one of your own, choose the 'Make' button to start your production in the app. Let the Shot List guide you through the production. Focus on one shot at a time. Each 'Take' goes to the timeline so there’s no complicated editing, as all the shots get stitched together into one complete video at the end. Tape each shot one by one. new Movie Skits apps, the latest Contest news, and our upcoming Kickstarter campaign we hope to run soon.